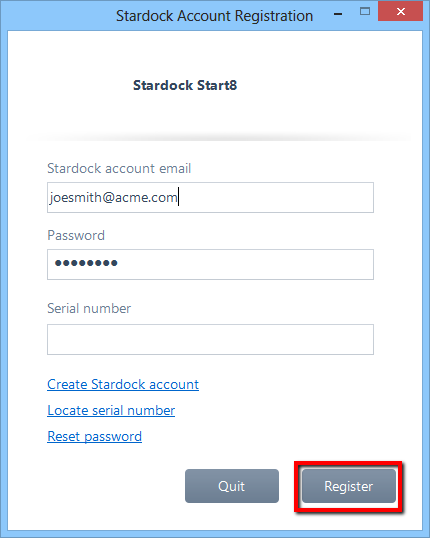 This page provides instructions for when you need to activate a Stardock product on a computer without Internet access or if the in-app method has failed (usually due to security or firewall obstacles). In these instances, the application will create a text file on your computer. The following instructions will detail how to obtain and process this file for activating your product. 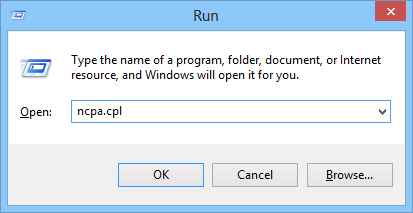 When a Stardock application has failed to activate with the initial in-app method, the subsequent instructions will direct you to an activation text file on your local computer (click for example). If you have not seen this prompt, or you do not already have the activation text file, please click the 'Need Text File' tab above. If you have the activation text file, please click the 'Have text file' above to finish the activation. 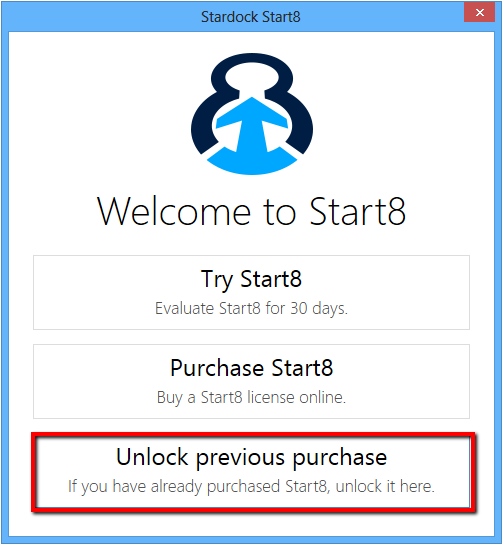 The following activation example will be shown using Start8. 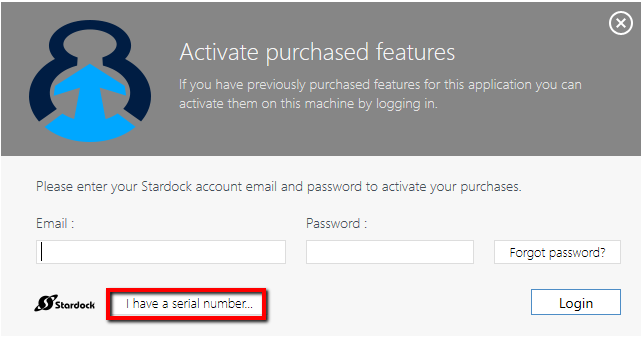 While most Stardock applications use the same activation method, some differ slightly. Alternate instructions will be given to accommodate these instances. Press and hold the Windows key and then the 'r' key. 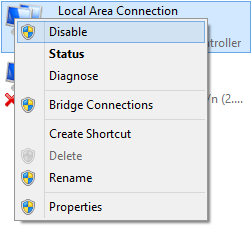 If you are on a wired network, right click on "Local Area Connection" and select "Disable". Alternatively, if you are on a wireless network, right click on "Wireless Area Network" and select "Disable". You will re-enable the connection after the activation process is complete. Start the application (ie: Start8). Please click 'Unlock previous purchase'. This prompt may already be pre-populated with your information. In any case, all you need to do is click 'Register', nothing else is required here. The resulting failure message is expected. Click 'OK'. Figure 7: Note: The serial number pictured here is not valid. You will be directed to where the activation text file has been placed. If you are activating on a computer with Internet, re-enable the connection now. Next, click here to return to the top of the page and select, 'Have text file' to complete the activation process. Note: Your text file name, and directory where it is placed, may be different depending on your product and version of Windows. If you are trying to activate on a computer without Internet access, copy the activation text file to an external storage device (USB stick, network drive, etc.) and take it to a computer that does have Internet access. If this is the machine you are trying to activate (and have the activation text file), continue to the next step. 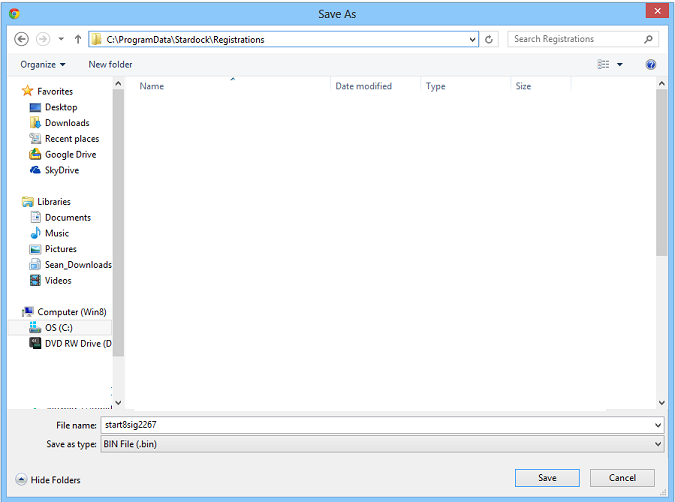 Click on the 'Choose File' button below and navigate to the activation text file detailed by your Stardock application (see Figure 1) or on the storage device you saved the file to if activating on a computer without Internet access. Select it and choose 'Open' and then click on 'Submit'. In the colored box below will be a link to download the activation file. Right click on the link and select "Save Link As or 'Save Target As'. If you are activating for a computer without Internet access, save the file somewhere and transfer it back to the PC you wish to activate the product on. Saving the activation file here will complete your activation process. Should it fail, please click here to create a support ticket. Please be sure to attach the original activation text file with it. You can finish your activation by selecting "Load Activation Response" and selecting the downloaded file. Your registrations have been looked up but no purchases for [ACTUAL INSTALLED PRODUCT NAME] have been found. This could happen if you are activating this product with another product's serial, mistyped it, or it does not exist on your account. The serial number has been disabled for the given email account. 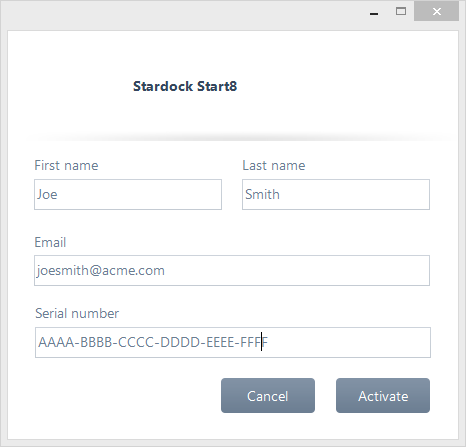 If your Stardock application initially fails to activate, it will display a similar dialog detailing where your activation text file was created and stored.